Apply the patch and run rake install. Now you can increment variables! I met some pitfalls in working on this small Rubinius hack. The parser is lib/ext/melbourne/grammar.y. 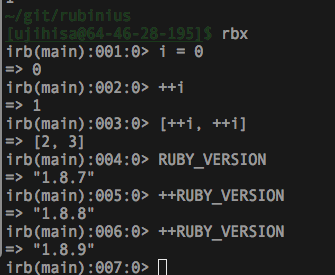 The Racc file lib/ruby_parser.y is just a dummy. To refer a Symbol, MRI uses rb_internal while Rubinius uses rb_parser_sym in the parser. rake build doesn't build the parser again. You have to run rake install.